In a move that will further complicate my life but make the boys ecstatically happy, we have a houseguest staying with us for the summer. He is twelve years old, and since our house is small and Cody already knows him, he will be bunking in Cody’s room. The weekend before last we went as a family to pick him up. I was apprehensive about this endeavor because we have more than enough going on in our lives as it is without adding to it. To be honest what has been keeping me up at night is that extra mouth to feed. In particular, Bungee’s mouth. Bungee is a twelve year old corn snake who is used to eating live mice every couple weeks. He is one of Cody’s kindergarten class pets. Every summer Cody’s teacher looks for suckers victims bleeding hearts families who want to keep one of the class pets for the summer. Since I was one of the kindergarten room moms (oh yes I was, and oh no I am so not doing that again) I told her we would take Bungee if no one else wanted him. I felt pretty safe in saying this because she had told me that he is usually the first one to be claimed, being that he is a snake and there is a cool factor involved with that. The three fish were the first to go followed by Shorty the stumpy legged turtle. Then nothing. She asked again in a general email to all the parents but there were no takers. So it was that on the the first day of summer vacation we found ourselves back at the school getting a lesson in how to feed and care for him. Corn snakes, sometimes called the red rat snake, are typically found in the eastern parts of the United States. They are usually dark orange or brownish yellow with large splotches of red down their backs. Their underside look like a checkerboard with alternating rows of black and white little squares and they can range in length from two to six feet. They are constrictors. First they bite their pray and then, squeezing them tightly in a warm inviting hug, suffocate them before gulping them down whole. Bungee is used to being picked up and generally manhandled (or is that kidhandled?) by several dozen adoring five and six year olds. He has never been so rude as to bite or suffocate anyone that is not mouse-like. He is used to the loud chaos that reigns in a kindergarten class. It is all old hat to him and he takes it in stride. He is a gentleman among snakes. I am not a snake person. They rather freak me out. I am sure I have touched a snake a time or two but have never held one until two weeks ago. And you know what I found out, he is kind of neat. I find myself talking to him in that high pitched sugary voice one reserved for babies and puppies. I have given him nicknames and find myself checking on him multiple times throughout the day worrying if he is warm enough or perhaps too warm. I feel guilt if he is not taken out of his cage and played with on a daily basis. 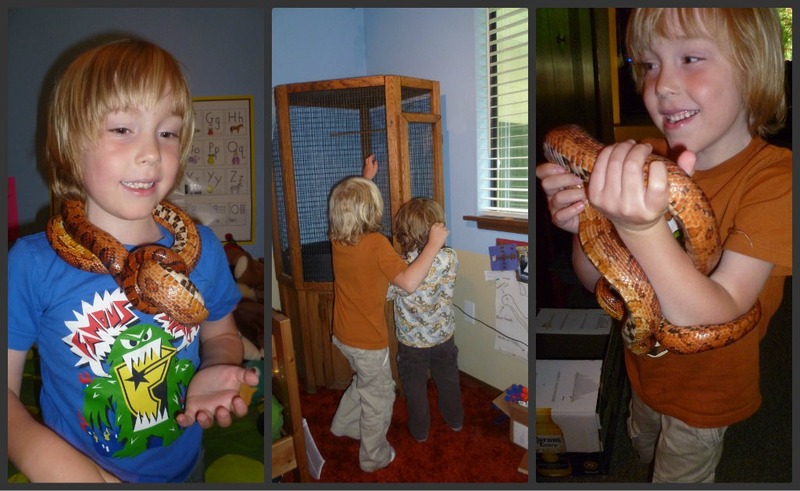 This entry was posted in Furry Feet (and fish) and tagged Children, Corn snakes, Family, Houseguest, Life, Parenting, Pets, Random, Snakes, Summer. Bookmark the permalink. You are a way, way cooler mom than I am. I am not too sure about that – maybe just a little more crazy than you. The thing that really gets me about him is that he never blinks (not his fault since he does not have eyelids.) It is creepy. And I am amazed at how strong he is. He is pretty creepy but I am not all that scared of him. I don’t like the idea of having to touch the mice when we feed him. We have cat/snake separation policies so nothing awful can happen to either one of them. Oh wow. Kudos to you. Those pictures give me the heeby-jeebies! The boys love wearing him around and he is pretty cool with it. They don’t like when he tries to slither into their shirt sleeves though. CO COOL! And you are definitely scoring big on the cool mom scale! I had an encounter with a snake or three over the weekend. Unlike your situation though, the snakes did not come home with me (fewf!). I’ll post pictures later. Check out my blog for my cool mom factor! 😉 Have fun with your house guest! I hope to see updates throughout the summer…maybe even a family picture including your new member…? I will have to pop over to your blog and see what cool mom factors you are talking about (did I miss a post?) I figure with all these extra cool mom points I am accruing I will be good for a while. Definite cool mom points for you!!! I am not really bothered by snakes, but the live mice would get me! I am not looking forward to the touching of the live mice part of this whole snake sitting deal. Plus Cody’s teacher said that Bungee gets a bit aggressive during and a while after feeding. What does that mean exactly?!? I guess we will find out, eeep! It will be interesting that is for sure. A great experience for the boys, which is mainly why I decided to do it. Are you serious??! I just think you are a great mother to your boys, you think their happiness first rather than your own dislikes. Kudos to you! You are a nice mom. No snakes for us! I do try. I have to draw the line at spiders though. No pet spiders. Ever. These are some wonderful pictures. Really enjoyed them. I am not much of a snake enthusiast myself, but do not fear them. Sounds like an interesting experience. Thank you, I am glad you enjoyed them. When we picked up Bungee from Cody’s teacher she told us that the snake is cross culturally the most feared animal. I don’t know where she got her information so I don’t know if it is indeed true but by her saying that it gave me a little more compassion for him than I think I would have had otherwise. That will be such a great learning experience for your family! Good luck with it all, and I hope that you will always know the whereabouts of the snake just for your own sanity. If it escapes, it will make a great blogging story:-) Keeping my fingers crossed that it does not escape and hide somewhere. He is pretty easy to keep track of. He sleeps a lot of the time and when we see him up the boys can take him out of his cage but only if Husband or I are right there and our cat is not around. You are a very daring woman. I always hated those “opportunities” to take home a class pet for the summer. We had guppies that stayed with us for five years! A snake, though? I couldn’t do it. My friend has a corn snake- they love frozen mini mice- yum! Good luck! I don’t see the point in fish but I guess it is because you can’t snuggle with them and I despise cleaning out fish tanks. We were told about frozen mice as an option but Bungee has only had live ones. I figured since there is no way we will ever have a snake as a pet, being able to care for one during the summer is a nice experience for us all. Very cool summer guest you have there! I would have loved something like this when I was a kid but my mom never liked animals. Well, not until us kids grew up and left home.. now she likes them.. bleh! I hope your summer is going well and that Bungee is loving it. Bungee is pretty neat to have around although as snakes do, he tends to sleep a lot during the day. We have always had pets. Growing up I lived out in the country on about five acres and we had over the years: cows, a horse, pigs, chickens, a turkey, rabbits, cats, lizards, hamsters, and fish. My parents were not too keen on dogs though so I did not have a dog until I met Husband.